One of the world’s most recognized and loved spiritual leaders, Mother Teresa has inspired millions with her extraordinary example of compassionate and selfless work for the poor, the ill, and the outcast. Considered by many to be a saint, she was a steadfast voice of love and faith, providing immeasurable kindness and guidance to the world’s downtrodden. We hope you’ll enjoy these short excerpts from her book No Greater Love, which offers the most accessible and inspirational collection of her teachings ever published. It is difficult to pray if you don’t know how to pray, but we must help ourselves to pray. The first means to use is silence. We cannot put ourselves directly in the presence of God if we do not practice internal and external silence. The interior silence is very difficult, but we must make the effort. In silence we will find new energy and true unity. The energy of God will be ours to do all things well, and so will the unity of our thoughts with His thoughts, the unity of our prayers with His prayers, the unity of our actions with His actions, of our life with His life. Unity is the fruit of prayer, of humility, of love. Silence gives us a new outlook on everything. We need silence to be able to touch souls. The essential thing is not what we say but what God says to us and through us. In that silence, He will listen to us; there He will speak to our soul, and there we will hear His voice. We do not need to carry out grand things in order to show a great love for God and for our neighbor. It is the intensity of love we put into our gestures that makes them into something beautiful for God. In order for love to be genuine, it has to be above all a love for our neighbor. We must love those who are nearest to us, in our own family. From there, love spreads toward whoever may need us. I want you to go and find the poor in your homes. Above all, your love has to start there. I want you to be the good news to those around you. I want you to be concerned about your next-door neighbor. Do you know who your neighbor is? There are many medicines and cures for all kinds of sicknesses. But unless kind hands are given in service and generous hearts are given in love, I do not think there can ever be a cure for the terrible sickness of feeling unloved. None of us has the right to condemn anyone. Even when we see people doing bad and we don’t know why they do it. Jesus invites us not to pass judgment. Maybe we are the ones who have helped make them what they are. We need to realize that they are our brothers and sisters. That leper, that drunkard, and that sick person are our brothers because they too have been created for a greater love. This is something that we should never forget. Jesus Christ identifies Himself with them and says, “Whatever you did to the least of my brethren, you did it to me.” Perhaps it is because we haven’t given them our understanding and love that they find themselves on the streets without love and care. Be kind, very kind, to the suffering poor. We little realize what they go through. The most difficult part is not being wanted. 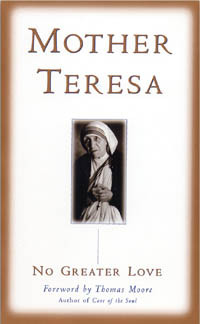 Mother Teresa became known to the world for her selfless work with the “poorest of the poor” in Calcutta, India. She was the recipient of many of the world’s most prestigious humanitarian awards, including the United States Medal of Freedom, the United Nations Albert Schweitzer Prize, and the Nobel Peace Prize. Excerpted from the book No Greater Love. Copyright © 1989 by New World Library.